Schizophrenia is associated with a specific profile of cognitive impairments that is related to psychotic symptoms and stress-related deficits in a complex manner. Many of these cognitive deficits resemble those observed following frontal or temporal lobe dysfunction. We have developed several computerized tests that can be used in both experimental animals and humans, in the so-called CANTAB battery. Thus we have devised a computerized analogue of the Wisconsin Card Sorting Test (WCST) for testing non-human primates that is sensitive to impairment in neurosurgical patients with frontal lobe excisions and schizophrenia. This analogue breaks the WCST down into simpler components, including intra-dimensional and extra-dimensional shifts, and reversal learning, which have been found to be differentially sensitive to lesions to different parts of the prefrontal cortex in monkeys, and also to differential neurochemical lesions of these regions. The extra-dimensional shift discrimination is among the most sensitive tests we have used for revealing deficits in high-functioning schizophrenics, but chronic patients also exhibit significant difficulties with the intra-dimensional shift, possibly indicative of impairments in abstraction. In first episode patients diagnosed with schizophrenia by contrast, the deficit on the WCST analogue, while qualitatively similar to that of chronic hospitalized patients with schizophrenia, is relatively mild in comparison with performance on other tests such as spatial working memory. On retest a year later however, performance on the WCST analogue appears to deteriorate further, whereas performance on other tests often improves. The deterioration in performance on the WCST analogue seems unlikely to represent effects of medication, as it is more prevalent in patients with greater durations of untreated psychosis. The utility of the WCST analogue as a method for establishing close relationships between specific cognitive deficits in schizophrenia and certain cortical regions is noted. 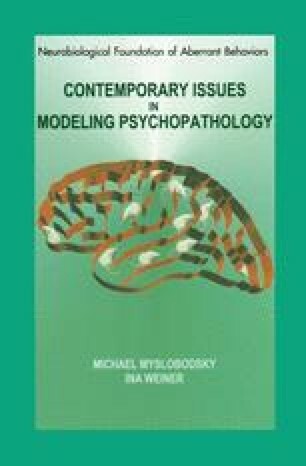 Its capacity for modification for use in rodents as experimental subjects, allowing a much more powerful means of manipulating certain key factors implicated in the aetiology of schizophrenia, is also explored. Both primate and rodent models are concluded to be necessary for modelling different facets of the cognitive dysfunction syndrome in schizophrenia.